Beautiful custom home on 3.2 wooded acres w/spring fed stream. 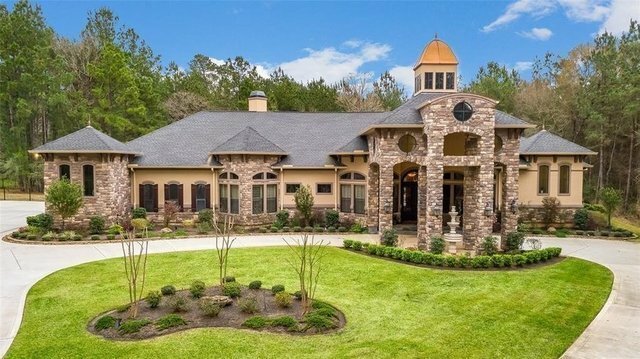 Gorgeous circular driveway w/porte cachere - side entry garage. Elegant entry 10 ft iron double doors-inviting views to backyard oasis w/1350 SF of covered patio. Custom knotty alder cabinets/woodwork, vaulted ceilings in study. Spectacular open concept provides living area w/beam ceilings, wine room, stone gas log fireplace. Chef's kitchen abundant in custom knotty alder cabinets, oversized granite island, more. Along w/breakfast area, all have amazing views of pool, hot tub, outdoor kitchen, wooded area backdrop. Master bedroom like no other - double doors lead to domed foyer - fireplace, wet bar/coffee bar, vaulted ceilings, walk in closet with washer/dryer. Master bath walk in shower, spa tub, double sinks w/granite. All bedrooms w/ensuite bathrooms-optional 4th BR or media room. Custom cabinets/sink in utility room. Whole house generator/sound system. Features too numerous to mention! Call today for a showing!